Knut stole the heart of Berliners after he was born in December but rejected by his mother Tosca. A bearded zookeeper moved into the enclosure to look after him round the clock. But Knut’s fate grabbed global attention after an animal rights campaigner said hand-rearing polar bears was a violation of animal rights. German media interpreted his comments as a call for Knut to be put to sleep. 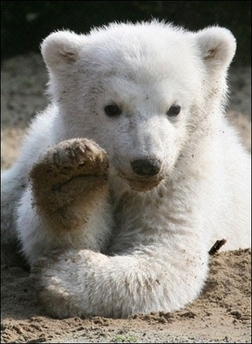 If I were to engineer an animal for cuteness, it would look an awful lot like a polar bear cub. If you can withstand the cute overload, enjoy the slideshow and video.